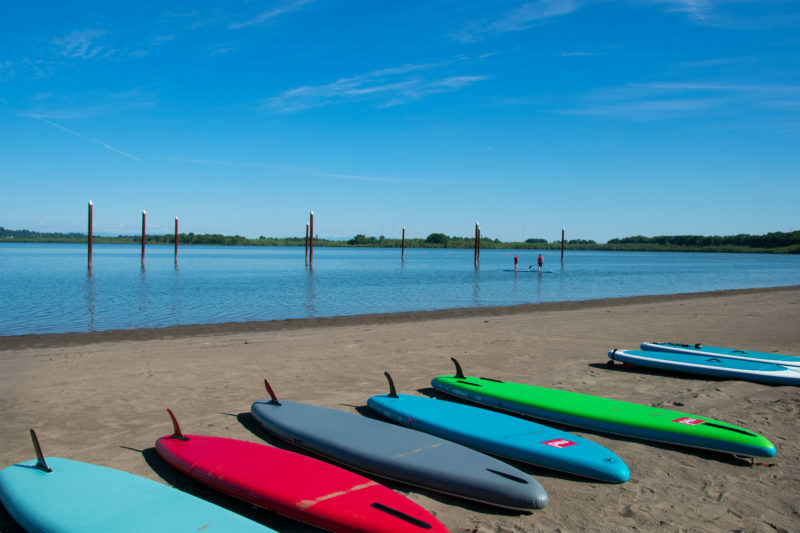 A local Stand Up Paddle Boarding favorite in Vancouver Washington, the soft sand beaches and large 190 acre Regional Park including 35 developed acres with picnic benches & BBQ’s on soft grassy areas overlooking the lake is a great SUP Destination for Portland Metro & SW Washington area paddlers. 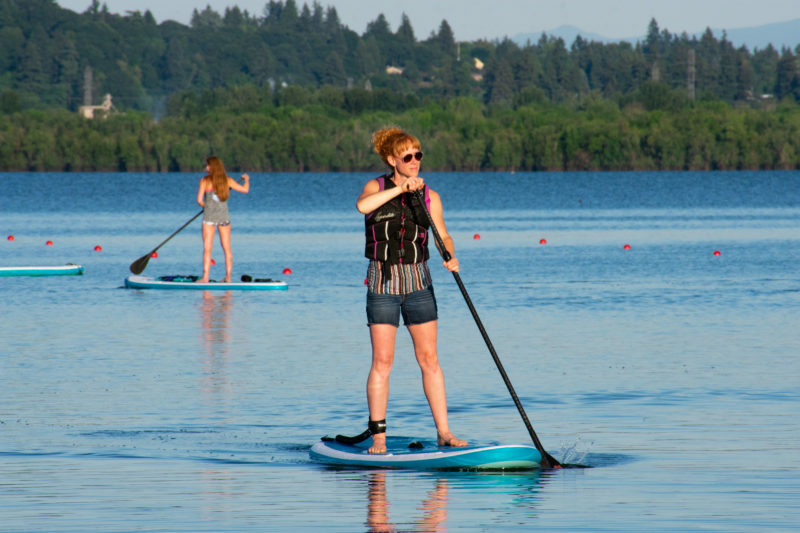 The lake itself is a perfect size for both beginners and those advanced paddlers looking for a place to sharpen their skills. The local non-profit Vancouver Lake Rowing Club holds team canoe events on the lake regularly, which is not only a blast to watch but also means paddlers can utilize the long buoy lines to hone their own paddle skills. It’s essentially a built-in race track with obstacle course on the water for paddlers! Of course we couldn’t help but let our competitive nature take over and were weaving in and out of the buoys and racing eachother for hours of good athletic fun. The lake is just is big enough to get a bit choppy on high wind days, as with any larger body of water it is always recommended to check the wind reports before planning a trip if you’re still at the early learning stages of paddling. The protected waters near the main beach area were calm enough for our 8 year old to paddle around at his leisure even on a high wind day, so even if you do find yourself at Vancouver Lake on a windy day and aren’t yet comfortable in the choppy waters, you can still have a great day on the water paddling closer in to the beach. Large paved parking areas near the beach launch sites plus additional overflow parking ensure there’s always available parking. Depending on how full the main parking areas are, you may end up packing your boards & gear roughly the equivalent of a city block. Large clean restrooms including foot washing stations are provided at the main Vancouver Lake beach & picnic areas. The gradual sloping beach allows for very simple launching into the calm waters surrounding the beach area. There is a small day use fee per vehicle, very affordable at under $10 even with our truck and enclosed trailer full of paddle boards. 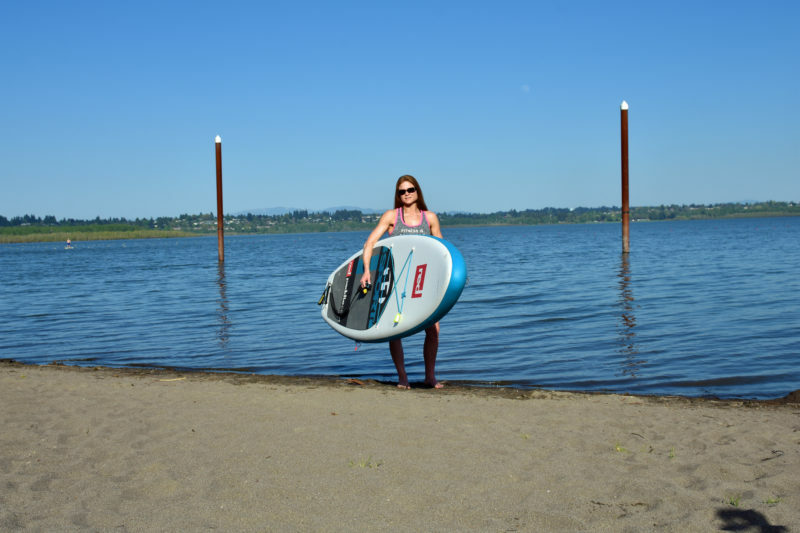 All in all, Vancouver Lake Regional Park is a great SUP Destination that paddlers of all skill levels will enjoy.